Business owners, we’ve just introduced a cool new tool for you. As we’ve discussed in the past, for most business types, generating customer reviews is a critical metric influencing how listings rank in Maps. There is also a rising importance of Google's own Places reviews as a ranking factor. But motivating customers to go online, find your Google listing, and leave a positive review is tough! So we gave this some thought, and developed a simple and quick way to help generate customer reviews right at the point-of-sale using a customized QR Code flier. Hand out printable QR Code flier to the customer at the point-of-sale (incentivize if you wish). Customer can use their smartphone to quickly scan QR Code to be connected instantly to your business’s Google Place Page. Customer can now leave a star rating and review. Just like that, you now have a lasting review on your business’s Google profile from one of your happy customers. If you’re unfamiliar with QR Codes, they are already pretty commonplace, and just about everyone has smartphones these days anyway so it’s usually a frictionless event. 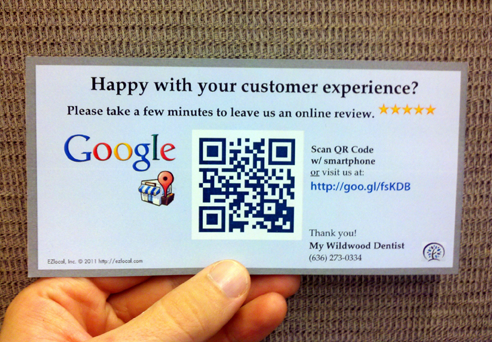 But even without a smartphone or “barcode scanner app” enabled, any customer can simply visit the custom Google Places URL printed on the flier and just as easily leave a review. We tested this out with a pizza place client of ours recently and they loved it. Bottom line: It works. All you need to do is email us if you’d like one customized for your business. We have this in flier format as well as business card sized.